One of the most competent manufacturers of Windows handhelds, ASUS proved itself a strange maker of GSM communicators based on Windows Mobile. It has started working on a model of this class long ago, but the design process dragged on. As a result, while this ASUS product existed only in press-releases and prototypes, HTC gradually came to the foreground. 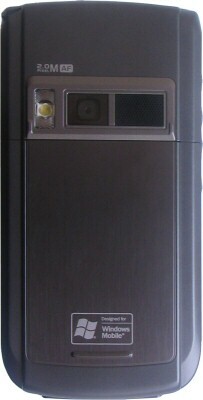 The ASUS first-born, MyPal P505 communicator, used to be the most progressive model in its class at the early stage of its development. But when it appeared on the shelves, it became just one of a number of similar devices. It was inferior to its main competitor, HTC Magician (Qtek s100/110, i-Mate JAM), in a very important parameter — image, which got very important, as communicators developed from purely practical devices for technical savvies to fashionable handsets for businessmen. Mediocre design, plastic, and painting significantly damaged popularity of the ASUS first-born. Nevertheless, the P505 offered a number of progressive ideas. It used to be one of the first communicators of the scaled-down 2.8-inch form factor. Engineers took into account that Windows Mobile 2003 SE was ill suited for handsets and they added a flip with a phone keypad to the communicator; programmers developed quite an unusual user interface, which granted access to the key functions and settings without a stylus and switched to a simplified interface, when the flip was closed. The prototype of this interface is easily recognizable — that's the UIQ shell for Symbian OS 7, used in Sony Ericsson P800/P900/P910. It was praised for phone ergonomics. So, ASUS reasonably tried to create its own "P900" based on the Windows platform and was close to success. The company drew conclusions from the P505 experience as to what should and what shouldn't be done. The idea of phone keys was really good — Samsung used a similar solution in its SGH-i750, but Windows Mobile 5.0 allowed not to design a user interface from scratch. It was expedient to coordinate the keys and OS applets plus a few proprietary utilities. Platform performance was also preserved on a sufficiently high level. At the same time, design and materials got radically better. ASUS MyPal P525 has incorporated all these changes accompanied by modern multimedia characteristics, radio and memory interfaces. ASUS MyPal P525 is assembled in a candybar form factor. Its designers made the communicator a tad larger in order to equip it with a numeric keypad. 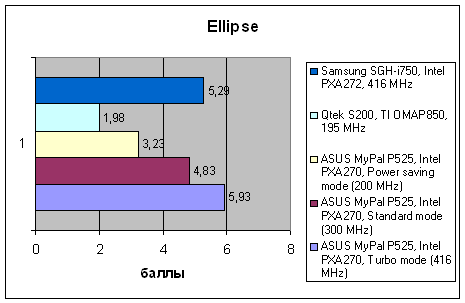 As a result, the P525 got bigger than communicators from the main competitors. But the difference is not large, it's noticeable only in height. It has no effect on the ergonomics. The same width means that the device lies in a hand like all the other 2.8-inch communicators. The device weighs 160 g, quite appreciable. But it does not seem excessive, it seems adequate to its dimensions. The P525 has a stricter design than its predecessor. It's all mostly straight lines and rectangles. They make it smaller visually. Compared to the P505, the P525 looks more compact. The new model looks much more imposing than the previous one, not only due to its geometry. Instead of primitive silver-paint of questionable quality, the P525 is painted as dark metal with semiglossy surface. You can make out three hues: the darkest — at the side inserts, medium — at the rear and front panels, and lighter — on the keypad and an insert near the lens. There are metal inserts at the back of the device and around the display, imitating rough polishing, favored so much by ASUS designers. There is a black glossy insert above the display. On the whole, the P525 looks stylish and imposing. But we should still note the excessively diverse colors and finishes. Differences in exterior suggest the same radical improvement in plastic quality in the P525, but that's not the case. In fact, the case is made of quite soft plastic. It audibly squeaks, when you squeeze or twist the device. The sound comes from the joints between the front and rear panels and side inserts. But they are most certainly not the only source of noise. The impression is not very nice. We detected no backlashes (in a brand-new production-line sample). But such "symptoms" suggest that they may appear later. Ergonomics and Controls. Thanks to concave sides, ASUS P525 is easy to hold in your hand. Semiglossy surface does not feel like a good grip, but it's not slippery either. Everything is OK.
As we have already mentioned, the communicator is equipped with a numeric keypad in the lower part of the body, like in a regular candybar handset. The keys are rather large (fortunately, the case is rather spacey), but their width is larger than height. The keys are sloping in vertical section, their bottom edges are updrawn, so the rows are arranged in stair-steps. It makes the rows discernible. But the keys are not spaced out horizontally, even though the wide case would have allowed such a solution. Gaps between the keys are not large - you can feel them by touch, but you will hardly manage to fast-type a number blindly. Another argument for "sighted" dialing is different size of almost all keys. In short, the keys provide a usual (and very rare for a communicator) phone-like style of operation. But it's not comfortable for fast operations. However, even such results are good, practically unique in this class of devices. The communicator is equipped with a 5-way joystick in an unusual place — between the keys "2" and "5". The "2" button over the joystick is slanting in the opposite direction and is much higher, so that it does not interfere with dialing convenience. This solution is quite good — we had no problems with this button or the joystick. The joystick is a small stickpoint, which surface is covered with soft antislip polymer. It copes well with its tasks, the joystick is very convenient to use. – Windows — calls the Start menu, it's absolutely mandatory in the Pocket PC interface, as keypad access to programs and applets is impossible without it. – OK — like in the HTC Prophet (Qtek s200) it closes a current window, even if you made no changes in its options. – Quick menu (circular arrows) — opens a special applet with the most popular (according to ASUS) service operations. – C — deletes the last symbol as you type. Side buttons of the ASUS P525 are typical of Windows communicators. The left side houses (from bottom to top) a volume control rocking button, a voice memo button, and a photo button. The right side contains the hold and power buttons. All buttons are metallized and have a high profile, so they are easy to find by touch. This and their tactile feedback make them convenient to use. Other external elements. 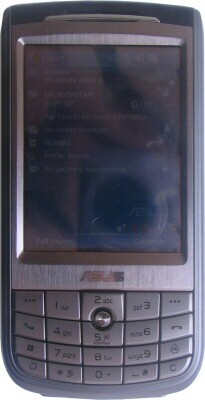 ASUS MyPal P525 is equipped with miniSD on top. A compact form factor allows to free some space inside the case, but it limits maximum memory capacity of a card. However, miniSD cards offer sufficient capacities these days. And in the nearest future maximum capacities of SD and miniSD cards should become the same. The back of the device houses camera lens, LED flash, as well as a slit for the built-in speaker that is responsible for ringtones. Mini USB for data and power cables is placed on the bottom. 2.5 mm micro-jack for a headset is located next to it. Stylus is in the traditional place — in a stylus bay in the top left corner of the rear panel. It's small, monolithic, made of plastic. The display is quite typical for Windows Mobile communicators. It's a 2.8” TFT transflective 320x240 matrix supporting 65 536 colors. The image is bright and contrasty, quite sharp, only minimally grainy. Sensitivity is good, the touch screen is gentle and responsive to presses. The Lithium-Ion 1300 mAh battery is rather large, it's installed into its bay sideways — contacts are on its right side. The battery covers a slot for a SIM card. The battery bay is covered by a sliding lid. We had no problems with installing and removing all these components. Package contents. The box with ASUS P525 also contains a charger, a data cable, a plain stereo headset, a leather holster, documentation, standard Windows Mobile CD with ActiveSync and Outlook Mobile, and another CD with an IP telephony client - Skype. Hardware configuration. 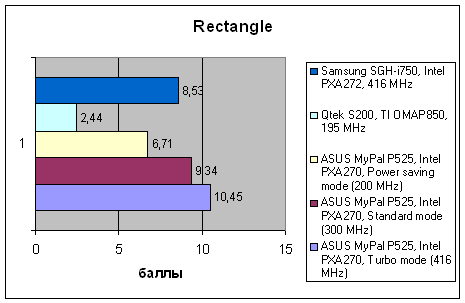 ASUS MyPal P525 is based on Intel PXA270 416 MHz. It's equipped with 64 MB RAM and 128 MB Flash ROM, the entire volume of the latter is available for installing user programs and storing data. The communicator is equipped with miniSD expansion slot, its wireless interfaces include Bluetooth (v 2.0 compatible), Wi-Fi (IEEE 802.11b), and IrDA. Wireline interface — USB 1.1, the device can switch between ActiveSync client and USB Mass Storage modes, it can also be charged from USB. Cellular communication module works in GSM 850/900/1800/1900 MHz bands and supports GPRS Class 10. At a closer look, P525 electronics offers nothing unusual for these days. 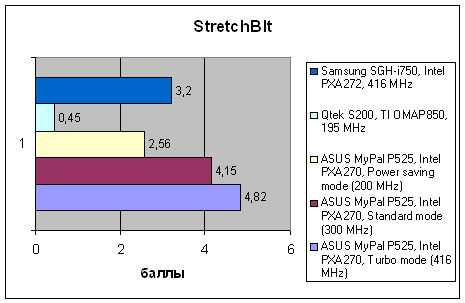 A 416 MHz XScale processor in the P525 is an alternative to the trend to equip communicators with very weak processors (HTC Wizard/Prophet; fortunately, HTC is also giving up this trend and uses faster chips in the latest communicators), 128 MB of flash memory is a standard issue in the new generation of communicators. The set of interfaces is also not unusual, except for Bluetooth 2.0 EDR - it's not unique, but it's still not wide-spread. Software. 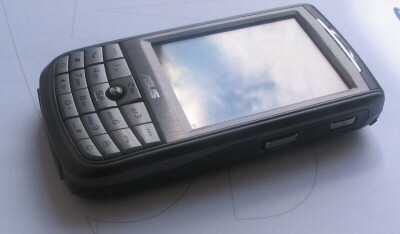 ASUS MyPal P525 works under Microsoft Windows Mobile 5.0, unlike the previous version, which older OS version was a drawback. Along with the basic set of applets, the communicator has a number of preinstalled applications and utilities, which is actually usual for ASUS that had stopped shipping "naked" mobile devices long ago. CPU Mode — this utility controls the clock frequency of a processor, it allows automatic performance control (depending on a task and a charge level), or you can specify one of the clock presets. ASUS Status — this utility runs in tray and shows all necessary information (CPU speed, memory (built-in memory and expansion card), brightness, and USB mode. Mode Switcher — this utility switches either between utilities in memory, such as turn the screen, return to home screen, or Media Player. Besides, in Task Switcher mode, the bottom left button can be used to switch between running applications. USB Setting — it allows to choose one of three USB modes — ActiveSync client with high or low data transfer rates, or USB Mass Storage. In the last mode, the communicator can be used as a flash drive. My Secret — this utility allows to hide secret information in a password-protected folder. Voice Commander — this program is used to create voice commands. Biz Card — this program scans business cards and converts the information into contacts. Camera. The communicator is equipped with a 2 Mp auto focus camera. These functions are typical of this class of built-in cameras, it allows to take photos and shoot video. But the image quality is rather mediocre — automatics that determines expoparameters works well, but photos are mostly blurry. That seems the fault of insufficiently good lens. The 416 MHz processor and a good implementation level of memory bring the ASUS MyPal P525 into the group of the highest-performance communicators. 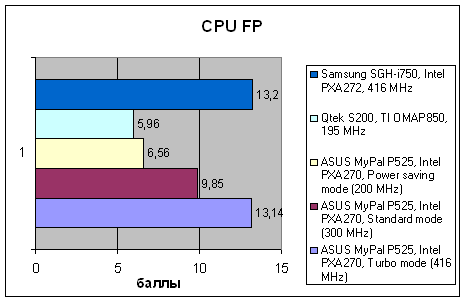 CPU performance in integer and floating point operations is expectedly appropriate to its frequency. 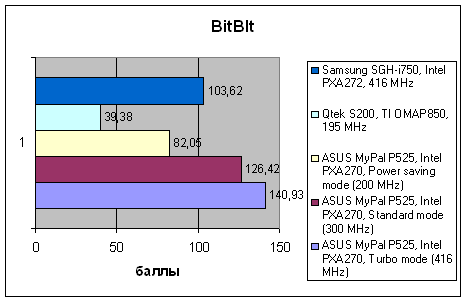 But graphics operations are executed very fast — data exchange rate with memory (video memory in Pocket PC is just part of system memory) is higher than in most modern communicators. 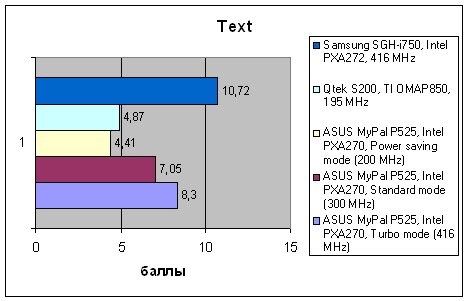 Lower results versus Samsung SGH-i750 in the Text test can be explained by Windows Mobile 5.0 in ASUS, while the Samsung model uses Windows Mobile 2003 SE; in the first case, user data, processed by the test, are extracted from rather slow system memory; in the second case — they are copied to fast RAM and only then processed. But the difference in results is rather small. 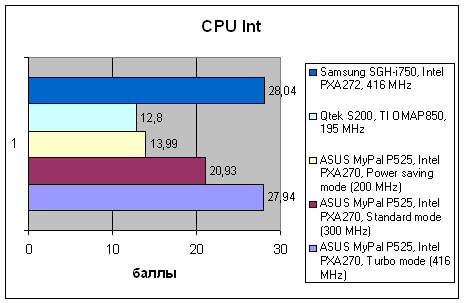 Thus we can say that the P525 is fast enough, despite peculiarities in its software architecture. Subjective performance of the communicator is rather high, we have no gripes with how fast it opens windows and responds to user actions. Battery life parameters are also good. In the phone mode (PDA functions are used only from time to time) with automatic CPU clock and disabled Bluetooth, the device has lasted nearly 4 days - 30-40 minutes of phone calls a day. Bluetooth reduces this time by one third. 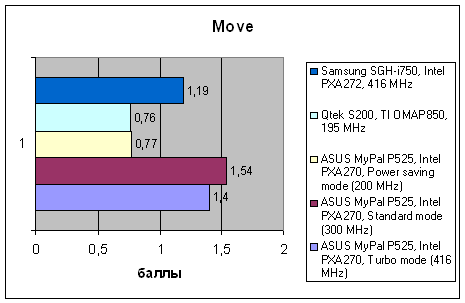 ASUS MyPal P525 provides standard reception quality, we noticed no specific problems with radio characteristics. From the technical point of view, the new communicator from ASUS is quite a success. This model is convenient to use both as a PDA as well as a handset (in the latter case it offers some advantages over other communicators), it demonstrates high performance, good battery life, and a rich equipment level. Compared to the previous model, this device has quite a lot of changes that improved its hardware and software components, case design, quality of the surface finish. Nevertheless, the weak spot of the P525 is still its "plastic quality - case design" combo. Squeaking case (when squeezed) remains the only usability nuisance. Competition in the communicator segment is plummeting now, both in terms of platforms and inside the Windows Mobile segment. Direct competitors to the P525 are Qtek S200, E-Ten M600/M600+, Samsung SGH-i750. The most popular product is the Qtek model, it offers very high assemblage quality, but its system performance is disproportionately low because of the weak Texas Instruments processor. The other manufacturers are true to the concept of a fast communicator and use 400 MHz processors in their models. The E-Ten product copies Qtek, but is inferior in terms of materials. 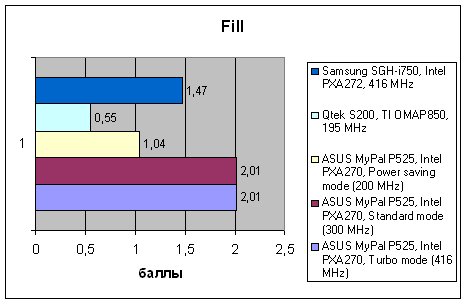 And the SGH-i750 is another model of a communicator with a phone keypad that directly competes with the ASUS model. The P525 seems a better balanced model, as its phone keypad is accompanied by a relatively large touch screen, while the Samsung model was designed to resemble handsets in its dimensions/weight and was equipped with a 2.4-inch touch screen. It made some PDA functions very inconvenient to use. As a result, the new model from ASUS is quite a good and promising communicator, which can be recommended to users who pay much attention to phone ergonomics.